-----As a geologist, I must make some comments about tsunami, after the events of December 2004. -----We are all horrified by the events of December 2004 in the Indian Ocean. We naturally, as people who travel on water and many of us living and using coastal waters, wonder if it could happen here. The geological answer is YES! And, not only could happen, but has happened many times in the geologic past along the Atlantic, Pacific and Gulf coasts. They are rare along any one shore, in spans of human lifetimes, but possible. -----The seism in Aceh was caused by slippage along the margin of the Indian Plate. Along the California coast, the Pacific plate is grinding northwesterly beside the western edge of the America's plate, which itself is moving westerly about as fast as your fingernail is growing. The San Andreas is the most obvious of these major faults, side-slipping along the plate boundaries. Ordinarily, side-slipping (or lateral) faults rarely generate tsunamis, although they are famous for major temblors. Could a major quake in CA generate a tsunami? Definitely, and most likely from the subsea "landslides," generated by the earthquake, creating large oceanic waves. 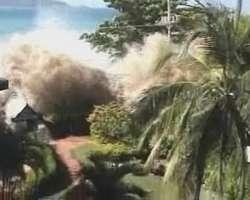 -----Tsunamis are most often associated with plates that are in head-on collision. The Christmas 2004 quake was generated by such impacting motion. Along the Oregon/Washington coast, the Juan de Fuca plate is grinding its way easterly, shoving itself under the westerly moving Americas plate. This is a similar head-on collision between plates. Large tsunamis have drowned the coastlines of these states in recent geologic time, and small tsunamis in the memories of some boaters who have grown up on these coasts. -----Alaska is seismically active and has, in this century suffered a number of tsunamis, the most recent in Lituya Bay where an earthquake caused the collapse of a mountain into the Bay, generating massive waves. -----Our (and Canada's) entire Pacific coast could suffer tsunamis generated as far away as Japan -- Hawaii has been nailed by such events. -----The East Coast has in recent geologic times had tsunamis hundreds of feet high, with water flooding inland hundreds of miles across the coastal plain from New York to Florida. These tsunamis were likely generated by earthquakes, and subsequent landslides, in the Canary and Azore Islands. -----The Gulf Coast is less likely to suffer tsunami, but earthquakes generated along the island arcs of the Caribbean could cause a seismic wave. -----A tsunami travels at hundreds of miles an hour across deep ocean, and may be no more than a foot or two high – virtually undistinguished from normal ocean waves. But the energy incorporated in that speed is transformed into building a lofty wave when the tsunami is slowed by friction against the shallowing sea floor as it approaches land. So, a distant earthquake may, and does, have a devastating effect within a few hours of an earthquake thousands of miles from your shore. Hence, warning time is reduced and only those areas that have an in-place set of sirens, clearly marked tsunami escape routes, and an informed populace have a chance to escape the waves. 1. As the seismic sea wave approaches a coast, and builds to lofty heights, the sea will withdraw from the shore! To build the wave, water flows out from land and in from sea. If you are near the shore or on the beach, and suddenly the water level begins to drop (obviously not just the normal tide drop), git outa there. Head up hill as fast as your car or feet can carry you. Many of the victims last week, ran to the shore – in curiosity or to pick up the flopping fish in what had been a bay. Some even went to secure their boats. Most were swept away by the tsunami. 2. If you are on your boat, say fishing just off shore, and you either hear the alert about a tsunami’s imminent approach or see the sudden lowering of sea level along the shore, head immediately to deep water. That will be outside the wave-buildup zone and be safe. Those along the Gulf, and large areas of the Atlantic coast, won’t have this option since shallow water may extend well offshore down the continental shelf. But, in New England, and most all the west coast, you can in your boat get into water thousands of feet deep in short order by simply heading seaward at top speed. Some tourists were saved last week when their fishing trips departed just before the tsunami and they were already in deep water. 3. Tsunamis come in multiples! The first wave is seldom the largest, and there may be significant time (sometimes, hours) between the arrival of waves. The second and third are usually the largest (by far) and a sequence of waves may be a dozen or more. Many of the dead last week survived the first wave, ran back to the shore to look for survivors, and were swept away themselves by the following larger waves.